The Artisan generously squares the dimensions by approximately 7 feet across the front’s width & depth meanwhile no worries about banging your noggin, access is superb, there’s roughly 2 meters of walk-in headroom height. Double doors deliver a wide entryway for rolling the lawnmower in & out, the floor’s purposely designed to subsist the strains of hefty storage tensions meanwhile the entire construction’s braced together by a steel infrastructure comprising a centred steel bar that intensifies roof support to accommodate substantial snow-loads. 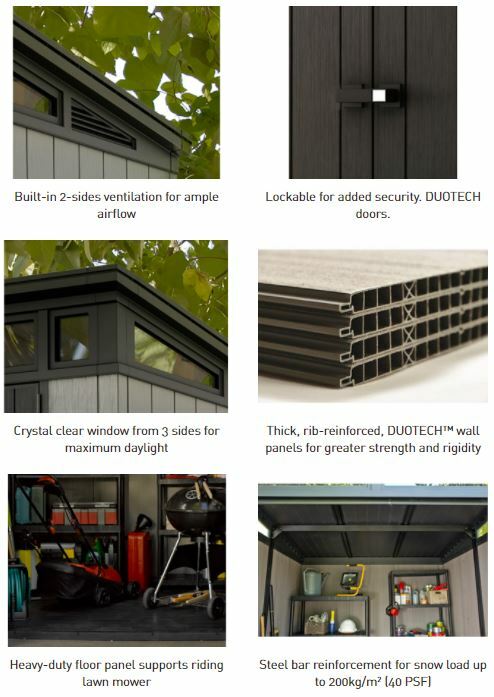 Recently, Duotech™’s groundbreaking design has been developed into an assortment of walk-in storehouses, mini-height sheds, patio stores, deck boxes and outdoor furniture, attributable to the manufacture’s elegance & style not being susceptible to the demise of weather-rot. Moreover, and unusually for resin, this composition caters for customisation, providing the opportunity to drill & screw into the facade panels to hang items & install shelving in addition to decorating the fascia in your imaginative colours, enabling to artistically brighten-up the home-yard. Personally I would leave Artisan’s rustic man-cave silvery guise the way it displays whereas my wife & friends have already worn their creative hats, baffling me with colour-coding conversations – ha! They would opt to paint – Would you? Captivating my interest regards the way Artisan illuminates oceans of daylight across 3 sides. Slimline windows positioned across the top sections above the doors accompany sleek triangular panes tailored to fit the roof-gradient of the sides. This clever design overcomes cracked skylights when branches fall, improves sturdiness due to the absence of wall windows, maintains cleaner looks albeit re-sparkling their shine becomes a snip meanwhile ascertains more privacy to what’s inside. Construction is simplified virtue of tongue & groove panel boards when comparing against Keter’s inexpensive Pent alternative making them easier to align from a levelled substrate prior to fixing however there are hundreds of screws to take into consideration. If you’re searching for a fast installation procedure, Artisan’s assembly does take time. Would you paint or leave as is? Duotech manufacture comprises polypropylene mixed together with weather-protective elements alongside unrivalled ingredients to make the resin uniquely paintable with acrylic emulsion. 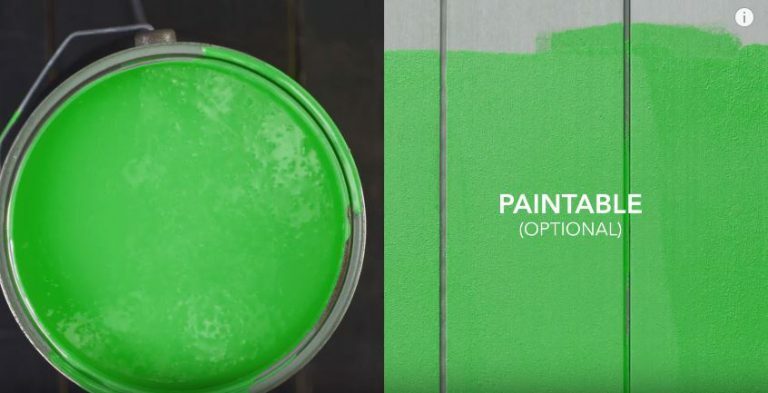 Have you ever noticed those kitchen & bathroom paints advertised as durable & wipe-able without leaving scuff marks due to containing protective hardeners? These are acrylic paints. As a consequence of being water-based, they’re a doddle to roll on and paint dries in a few hours aided by the outside breeze meanwhile cleaning-up presents no issues. There’s an abundance of colour choices to effectuate ideas & satisfy one’s creative juices meanwhile there’s varied finishes available too, from the sheen of high gloss to the subtle tones of matt besides eggshell & satin in between. Alternatively, you can simply leave Duotech’s silvery tones the way they display. Duotech’s make-up constitutes UV inhibitors to toughen the manufacture with an armed guard in order to combat sunburn stresses delivering fractures, deformity and colour-bleach to the presentation meanwhile the composition resists peeling when afflicted upon by sun-rays. If the shed is painted, this will inevitably lead to colours fading overtime however prior to applying another coat in order to revitalise the display merely necessitates a wash & dry before proceeding, there’ll be no rotten panels to replace. During Duotech’s molding procedure, a double skin is formed for the wall panels further to being bonded together by centre-ribbed reinforcements to improve construction stability and to withstand the occurrence of dents. Okay, a hammer blow to the fascia will deliver cracks however unlike the slight knocks that lead to unaesthetic dented appearances on single sheet fascias, this design is purposely configured to resist. Enriched molding techniques surpass preceding manufacturing methods by showcasing artistically creative wood-grain textured patterns embossed across the surface complemented by the silvery rustic shade resulting in a simulation of enchanting weathered-wood from a distance, up close and to the touch. In the course of molding Duotech’s charming presentation, each panel is formed with tongue & groove edges streamlining assembly. Simply slide the panels until the holes align, then secure with screws onto the steel frame. Artisan’s highly presentable resin manufacture is unaffected by weather-rot and corrosion no matter whether the shed’s permanently located in a damp setting, under duress from persistent showers, sweltering heat or icy cold winters, even the exposed metal framework & beams are protected with a rust-proof powder-coat shield. Refreshing the fascia’s appearance involves an easygoing relaxed cleaning approach. Either the convenience of clicking the shower connector onto the hosepipe, the quickness of a pressure-wash or the conventional soft-brush & scrub method meanwhile applying a squirt of mild detergent soon dislodges moss or anything ingrained. Artisan’s roof structure showcases the correct ‘Pent’ design whereby the front is raised to deliver the highest point and slopes down a descent gradient towards the shed’s rear to effectuate a prompt rainwater repellent system. The roof’s composition is formed from 3 sheets of double-lined tinted-black imperishable polypropylene, delivering a sturdy yet impermeable make-up. Where each roof section adjoins, their edges slide into support strips containing grooves installed down the length and at the sides. The edges of the roof and support strips overlap the fascia walls ensuring internal leaks are eliminated. Bolstering support is virtue of a steel bar system that’s centrally positioned, onto which the roof panels and their grooved supports rest upon resulting in a roof capable of accommodating 200 kg per sq metre of snow-load support making this Pent roof design surprisingly sturdier than Oakland’s Apex structures that trumpet out a strengthened configuration due to comprising steel trusses. Crystal clear windows situated on 3 sides bask Artisan’s interior with a profusion of natural light meanwhile they should remain spotless longer when compared to the grubbiness roof-skylights soon encounter, derived from the bounce of rainfall showers not forgetting the unfortunate breakages tree branches sometimes deliver falling down upon them. Maintaining their shine’s super-easy with a wash-leather or a spray of a window-cleaner & polish once the grime appears. 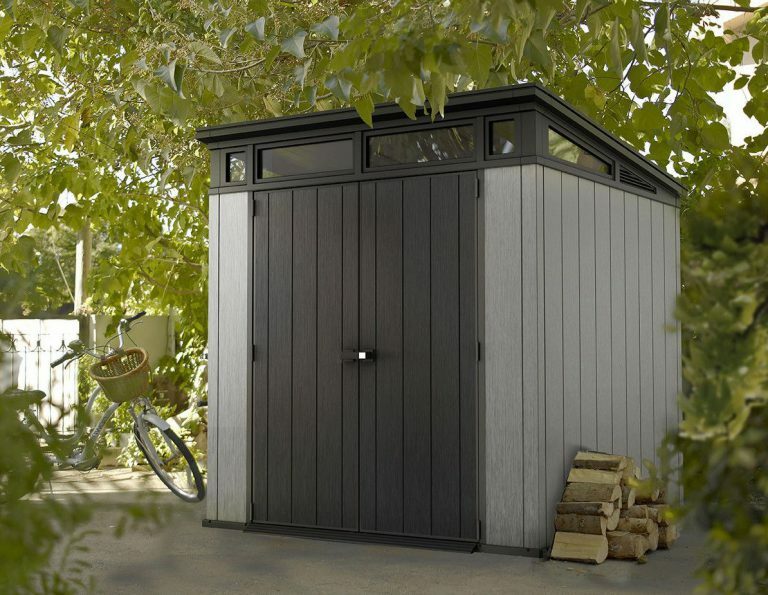 I think the way Artisan showcases the windows flaunts a chic finish to an already stylish shed. The flooring joins together to form one weighty thickset polypropylene base panel that undergoes strengthening during manufacture enabling it to subsist the stresses of tractor mowers and accommodating considerable sized storage. Entry is aided by the sloped threshold. Molded into the floor’s boundary forms a groove to which the wall panels interlock for the purpose of blockading a critters’ passageway, preventing wind-wafts of outside debris entering and stopping the progression of rainwater puddles emerging on the inside. Accessibility really doesn’t get any better whereby 2 strapping doors open the near breadth’s expanse providing the advantage for driving in lawn cutting machinery and storing over-sized equipment. Made from twin lined polypropylene they assure sturdiness & resist the rot meanwhile an effortless wash swiftly revives their appearance. When the doors close together you turn the handle which operates a stainless steel locking system, shooting two deadbolts. One slides into the top door jamb, the other embeds into the floor whereupon a padlock clasp secures both doors simultaneously. 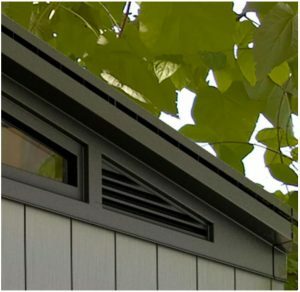 Triangular air ventilation grids are situated at the end of the windows sleek side panes. Situated on opposite sides they develop a fresh-air distribution system to the inside to overcome sweaty environments generating saturation and unpleasant clammy atmospheres when humid conditions persist. 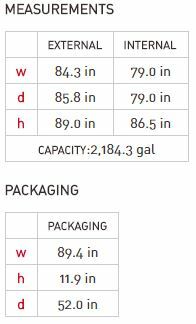 It’s worth noting when comparing the differences between Oakland sheds and this facility, only the Artisan integrates ventilation panels. Duotech design regards a groundbreaking resin manufacture that uniquely caters for drilling & screwing into the walls for installing hooks and shelving using specially designed D-Clip wall anchors to attain a solid fix, their hollow design resembles a similar configuration to installing on plasterboard albeit stronger due to the wall anchors. Great for organising gardening equipment to hang against the walls however shelves do have a weight limit, the reason many of us install a bank of self-assembly shelving for supporting hefty gear, high-up. Installing Keter’s Artisan is undoubtedly configured straightforward as a result of their tongue & groove fascia sheets that swiftly interlink, align and fix into position against the steel infrastructure however I wish I could offer you a speedy assembly but unfavourably there’s oodles of screws therefore construction’s quite a stretched out process. Okay, assembly represents a one-off procedure however construction may take two people towards a full day. Focus on laying a levelled substrate of solid foundations prior to commencing to ensure the build constructs perpendicular thereby ascertains: the vertical standing functions accurate door swings and underneath’s solid material determines the floor is able to subsist the weights of tractor tensions besides attaining unyielding anchorage. Artisan’s ideal base substrate can be existing paving slabs, asphalt or tarmac providing it’s completely level. Alternatively, laying a solid platform of wood deck boards above a flood plain level is also fine for a shed expanding these dimensions meanwhile preparing a levelled slab of concrete caters for heavier duty services. Keter have produced an extremely detailed construction video for the Artisan (presented below) whereby they demonstrate how every part fits & secures. I would proceed by arranging all the parts in order, organise the screws into separate compartments followed by reading the instructions alongside watching this video as a helpful aid whilst assembling. Keter’s groundbreaking Duotech manufacture improves sturdiness as a consequence of reinforced double walled panels, exhibits classy smart looks through the silvery rustic charm of simulated weathered wood meanwhile assures decay-resistance at the forefront of their design. Uniquely however, Artisan is fully customise-able, paving the way to add a vivid splash of colour to enlighten your garden’s scenery further to exclusively configuring the inside by installing shelves & hooks to enhance services required. Okay, assembly does take a while to construct owing to the abundance of screws however considering the 10 years of warranty assurance, Artisan’s Pent storehouse is well worth contemplating. Thanks for examining Duotech’s plastic pent roof sheds. Share your favourite weather-resistant pent roof design below along with any niggling queries. Always happy to help where I can. Please share Keter’s Artisan. Thank you. 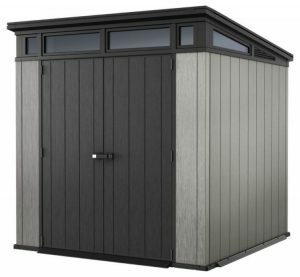 I really like this product Artisan Pent Roof Shed, the specifications are credible are elegant outdoor looking. I have my own house, not renting. And I was thinking of having outdoor storage room because I used my garage as my storage are for lawnmower , bicycle, etc. I always shop at leading depot warehouse but I think I never seen this design yet. Do they assemble it for me when I decided to order one? Thanks for this awesome reviews. A lot of credibility and statement. Thanks for sharing. Hey Bien, thanks for calling in to read about Duotech’s new arrival, the Artisan. I also like the pent style, the sleek windows deliver oceans of daylight and will rarely get dirty meanwhile unlike the majority of shed skylights, no branches will fall down and crack them. The Artisan incorporates ventilation grids, a feature Oakland sheds are absent from meanwhile the roof seems a cracking design, comprising grooved interlinking sections to overcome internal leaks besides delivering an adequate gradient to ensure a prompt rainwater run off system. Inside, the 7 x 7 footprint’s able to accommodate a fair amount of storage, a sloped threshold and toughened floor caters to sustain the movement of lawnmower stresses meanwhile the roof doesn’t incorporate steel trusses therefore opens up the lofty ceiling expanse. This roofing system is twice as strong as Duotech’s Oakland sheds too, due to introducing the reinforcements of a steel bar system. All Keter’s sheds are self assembly. The main requirement is to ensure you construct from solid and level ground. Start off right and you’re rolling. If you’re not a DIYer or haven’t the time, ask a local handyman to construct it for you. The Artisan will not be completed in a few hours, more like a full day to be honest. There’s hundreds of screws to secure so it’s quite a timely process however it’s pretty straightforward, just follow the order of steps and implement what’s show. The video up above in the Assembly Section clearly demonstrates what’s involved. Personally, I would watch this video whilst installing, it’s that detailed. Hey Sarah, thank you for your kind words. I’ve simply found the escape route to garden shed maintenance meantime I like to share the array of sizes & styles available including new entrants like this Artisan for others with similar desires to sidestep frustrations. Yesteryear’s plastic couldn’t cope with the scorch of sunburn assault, the sun-ray heat used to blister and crack plastic surfaces stood outside and cause colour distortion, usually termed as a bleaching effect. Rolling through the years accompanied by many technical advances to combat this issue, UV inhibitors mix in with the resin and act like a toughening agent delivering arm-guard defence against the stresses. You find most manufacturers stabilise their compositions nowadays whether using polypropylene like Keter & Suncast use, polyethylene is Lifetime’s material, polycarbonate in Palram’s, Grosfillex use PVC meanwhile although Asgard sheds are built with heavy gauge steel, they are coated with polyester powder to combat colour fade. There’s a lot to be said for the recent weather-resistant properties of resin. Duotech manufacture contains a unique formula, described as resin talc delivering a surface that adheres to water-based acrylic paint therefore caters for customisation in your exclusive colours. The beauty is, emulsion is such an easy job to roll on and dries quick compared to oil based primer & gloss. Wow! I know where I am going to go the next time I need a quality shed! 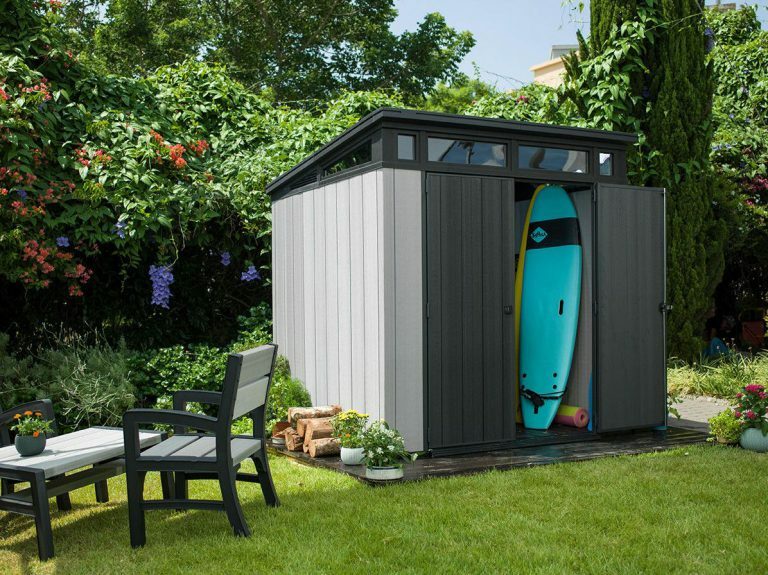 Not only do you give every detail on this shed – but your page comparing all the 7×7 sheds is so great to have! 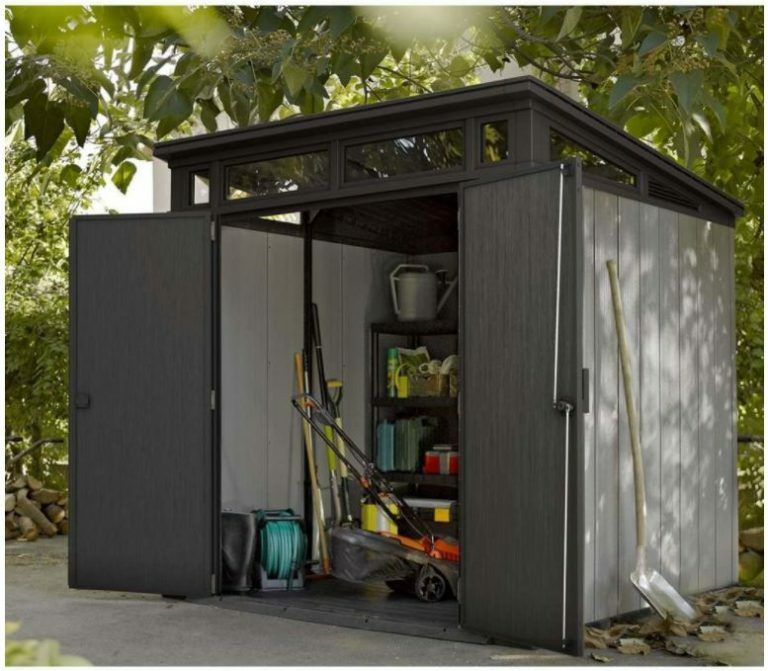 We just bought a plastic shed last summer – I don’t remember what brand or even how big it is – it does serve the purpose of storing yard tools! 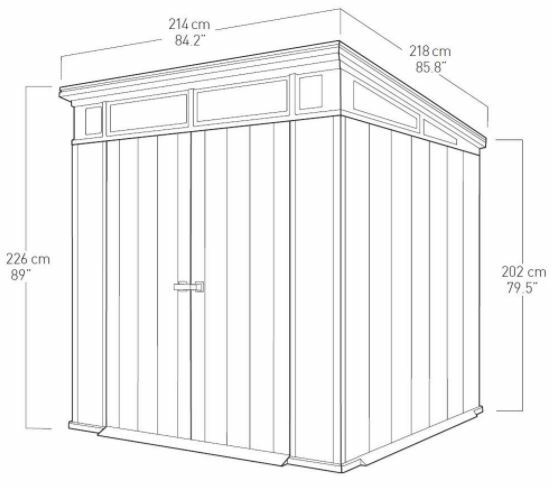 Hey Heather, thanks for calling in to read about Artisan’s 7 x 7 ft pent shed. 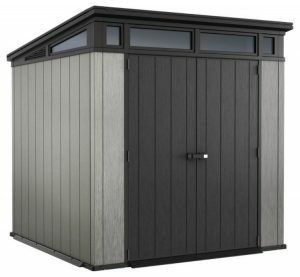 I have written so many reviews on various models and dimensions of resin sheds, I thought by creating a Shed Sizes post displaying each shed’s image & dimensions along with setting the page out running from the smallest to largest storehouse would be a great navigation page for this website. Simply scroll down to your desired dimensions & click the image to read the in-depth review. Like most people, we used to have the conventional wooden hut stationed in our backyard but throughout it’s lifespan we were constrained to re-varnishing the structure with wood stain each year, replacing decaying panels along with the sporadic roofing felt exchange, most of which was a timely process to say the least but if left would present problems. We decided to make the switch in order to alleviate the continuous annual dilemmas we kept facing and like you mention they conveniently serve the purpose they’re designed for meanwhile the new entrants such as this Artisan are exhibiting some ultra stylish appearances combined within their imperishable make-up. Hey Patrik, thanks for exploring Artisan’s plastic pent roof sheds. 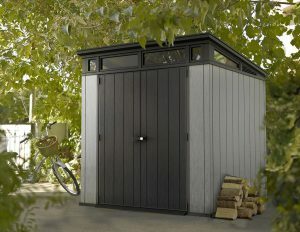 When Keter first released their Oakland range of sheds which constitute the same Duotech manufacture as the Artisan, they enhanced their promotion by trumpeting out a stronger shed able to accommodate 100 kg per square metre of snowfall which is a fair lump to any imagination, virtue of a series of steel trusses stretched across the apex width inside which connected to the steel vertical struts of the wall framework. Artisan’s roofing structure comprises a different configuration whereby a centred steel bar system situates vertical either side of the walls and across the roof structure in order to reinforce the top. It’s a clever design whereby they have doubled the strength of the Oakland sheds, boasting the Artisan is able to support a snow-load of 200 kg per square metre virtue of this steel bar method meanwhile inside due to the absence of steel trusses, the ceiling opens up the roof expanse. Duotech is a unique resin material which adheres to acrylic paint due to a resin-talc formula besides containing UV protection & the rustic silvery shade however the main ingredient comprises environmentally friendly polypropylene which delivers an imperishable make-up that doesn’t decompose nor become affected through weather climates however fortunately a high percentage of the manufacture is re-usable therefore can be recycled into alternative resin products at the end of the shed’s lifespan. Thank you for such a great review. I love that this shed stands up to the test of time. I think I would leave it as is rather than paint it I really like that look. I also like that this shed looks classy not like the old tin sheds. Its something I wouldnt mind putting in my backyard. Hey Jackie, thanks for stopping by to investigate Keter’s Artisan pent roof storehouse. 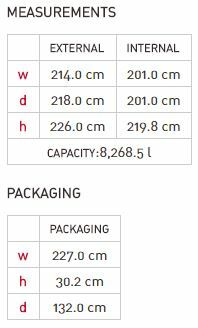 The benefits of imperishable polypropylene are that it withstands the collection of weather elements long-term, remaining immune from depreciation. Good job it’s recyclable because there’s no definitive timescale to when a polypropylene make-up will start to decompose therefore being reusable into the future’s resin products represents a huge environmental advantage in my book. I too like the rustic charm Duotech manufacture exhibits therefore I would choose to leave as is rather than paint. The images concerning the customisation of Keter’s High-Store is what sparked conversations of artistically creating your own unique statement of colour choice. Yeah, a pent style certainly has the stature of the conventional tin hut. I’m surprised how much stronger Artisan’s roof is compared to Oakland’s apex structure comprising steel trusses. The doubling up of strength is virtue of a centred steel bar to which supports the roof conjointly with the walls delivering an overall beefy construction. Super informative site. Thank you for sharing. I agree with Andrew – they’re definitely a more attractive finish and are usually worth the money. Hi Pat, glad you like the website, thanks for calling in. The original resin shed presentations displayed very glossy looking fascia panels whereupon it immediately became apparent they were plastic in manufacture however evolving through recent innovative methods in the way resin is molded, there’s some impressive appearances along with much sturdier constructions being developed. Polypropylene regards the resin to which Artisan is predominantly manufactured with thereby ascertains the make-up is imperishable throughout clammy & damp conditions, sweltering heat to icy cold winters with plenty of rainfall in-between without succumbing to depreciation through weather-rot. Fortunately however, polypropylene is recyclable. It’s encouraging to know it can be used into alternative products at the end of the day due to lasting both of our lifetimes out without decomposing. I enjoyed this article because it is informative, and has all the information you could possible need on the plastic pent roof sheds. I like the fact that it can be painted, as sometimes the colour they are made in can be quite ugly. Thank you for explaining which paint to use as well. Hey Ruth, thanks for exploring Artisan’s pent roof design. When I first investigated Duotech’s design after hearing they had uniquely developed a paintable resin manufacture for customising outside storehouses, my initial thoughts for the paint to adhere to the surface would be an oil-based manufacture but they surprised me by promoting acrylic emulsion. Painting oil based paint over such a wide area like a shed can be a daunting task to achieve all your brush-strokes going in the right direction meanwhile I have never had much success with rolling on gloss however water based acrylic as advertised for painting bathroom and kitchen walls is a doddle compared. We use acrylic for decorating every room nowadays due to its hard-wearing surface being tough enough to wipe away blemishes without leaving scuff marks. It rolls on like a dream and dries super-quick. If you prefer 2 coats like I do, by the time you’ve painted the first coat, where you started will be dry & ready to keep on rolling. The huge dilemma relating to Duotech’s rustic weathered charm is could you fashion to cover it up? This is such a detailed and informative review. If one had any questions about this product they will find the answers here. Thanks for taking a look around Artisan’s pent roof shed Maurice. Hopefully these articles provide visitors with all the relevant information to help them make an informed decision for protectively storing outside gear in a weather-resistant construction, that’s my incentive. If anyone has any queries or niggles, feel free to contact via the comment box below, I’m always happy to try and find the answers, if not we’ll message the manufacturer. There is a lot of credibility for these plastic sheds as they can have a longer life span than the wooden ones.They will not rot away or deteriorate and can actually make the garden quite attractive. 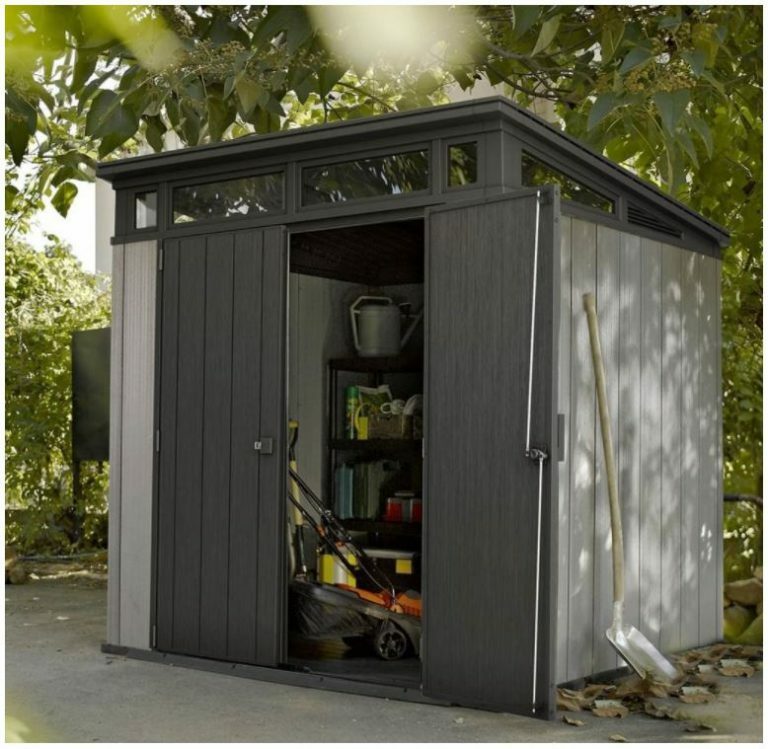 I have had something similar to the pent roof Shed just for my garden tools , a small 5ft by 5ft,, perfect for my needs. 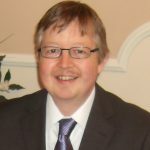 Hey Andrew, thanks for calling in to read about Keter’s Artisan pent roof shed. For our circumstances, purchasing a plastic constructed storehouse has been a real time-saver due to escaping the laborious re-varnishing duty every year, not forgetting substituting rotting panels and the sporadic roofing felt replacement after rainfall has entered and soaked storage. Imperishable resin bypasses all these troubles. I agree with the stylishness recent designs are displaying. 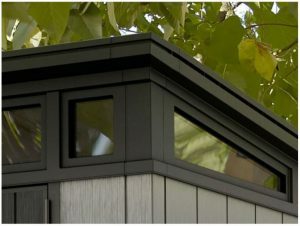 New methods of molding techniques are producing extremely realistic wooden creations meanwhile Keter are producing composite sheds for those who pine for traditional appearances further to customise options like this Duotech range that caters for colouring the fascia panels in resplendent finishes to brighten-up garden settings. Keter’s method of joining the 3 roof sheets together is an impressive design. When you inspect the assembly instructions they connect together by strips that contain grooves whereby they extend beyond the walls, completely overlapping to eliminate the chance of rainwater finding entry meanwhile the roof pitch has an adequate gradient to effectuate a prompt rainfall escape without puddling. 5 x 5 feet holds a considerable amount of stuff meanwhile this Artisan stretches 7 x 7 ft therefore accommodates a whole lot more. 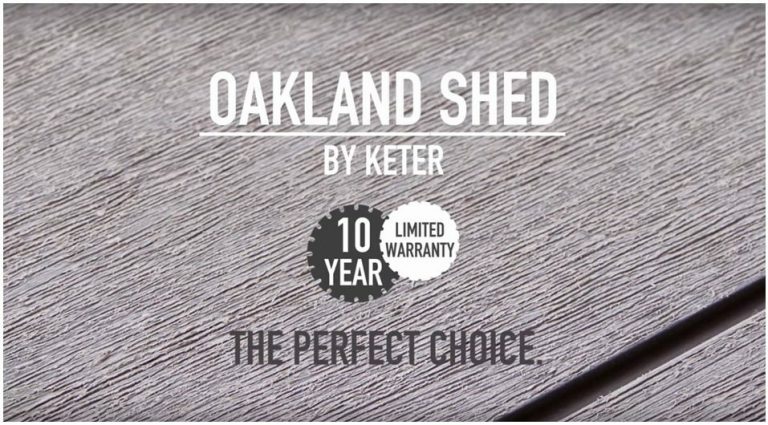 Keter also manufacture a 6 x 4 ft pent shed although due to the roof overlap the inside is deceivingly smaller which does frustrate a few however the resin construction isn’t as robust as the Artisan but the price is considerably less expensive.